Welcome to Tiny Wooden Pieces. If you want to chat to us, please use the comments section below. On your right, you will find buttons to talk to us on Twitter and Facebook. You can also email us, if you’re willing to poke about the site a little, you won’t have too much difficulty locating our email address. We are not affiliated with any of the sites linked on the right sidebar, but they are all sites we admire and respect, so if you don’t know them, have a look. Obviously, they are all about boardgames. If you don’t like boardgames, you are probably lost. Here’s the exit. If you are using the comments, please be nice to your fellow commenters. I’m sure you are all lovely people, so there’s no reason we can’t all get along. While we did just launch, we have been running quietly for a few weeks, so with judicious use of the back arrow located under the comic you will find previous comics. We do hope you enjoy then, and browse with us again sometime. First of all, I’d like to point out that there is absolutely nothing to be ashamed of by playing boardgames. Or even talking about boardgames. Here at Tiny Wooden Pieces, we want to encourage as many people as possible to take up this splendid hobby. And we are happily doing so through the equally socially acceptable medium of webcomics. Which we also love. But back to boardgames. 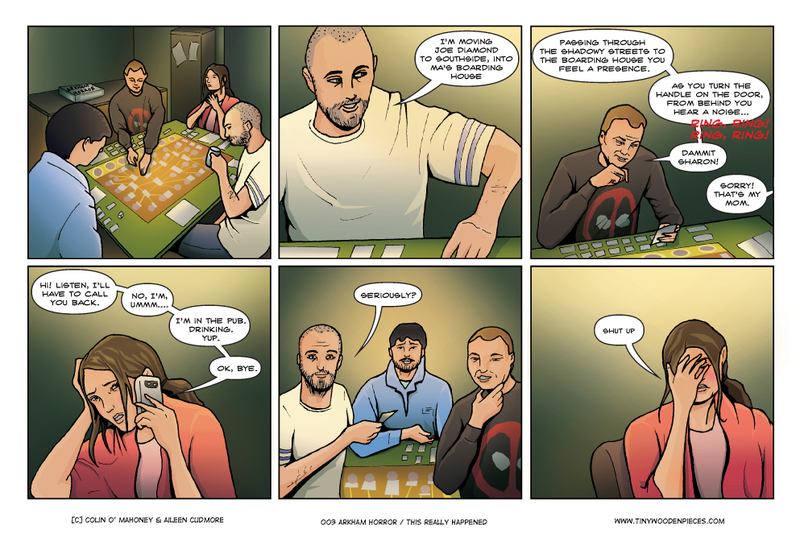 Boardgames and cardgames are for everyone, your friends, your family, your work colleagues. They are more accessible now than they have ever been before. And there are more games out there than ever before, with new games being released every single week. There is undoubtedly something to suit every person and every occasion, with games covering every category you could possible imagine – from strategy and family games to bluffing and, ah, trains. Basically, there are games that will allow you to have an unforgettable time no matter what your tastes. Winning often doesn’t matter, in fact it’s usually something that just happens along the way. Games simply allow you to have fun with your friends. And over the coming weeks and months, we hope to show just how much fun they can be. This is hilarious. Took me a while to get off the floor. But then oh…. so true! Just found your site and it is excellent.